WheresItGo is a helpful service that allows you to extract the real URL of a shortened one, or even find out where other redirected URLs, such as the ones used by FeedProxy, go. 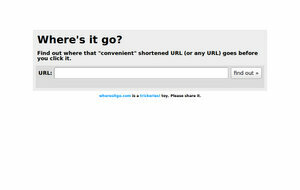 WheresItGo is the creation of trickeries!. To learn about what is new from WheresItGo, simply follow the updates on Twitter @re5et.